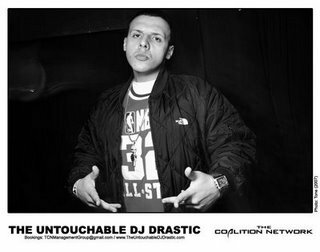 Earlier this week, I finally got an opportunity to interview one of Brooklyn’s finest, The Untouchable DJ Drastic. This is something that I’ve been trying to do for close to a year now. As I sat in a white Cadillac Escalade, The Untouchable DJ Drastic began to play tracks for me from MIMS’ forthcoming album. He told me that he wanted my general opinion of the songs. The first song played was “Therapy” produced by Pharrell of The Neptunes followed by “Barock Star” then “Move” which I’ve heard in recent months. 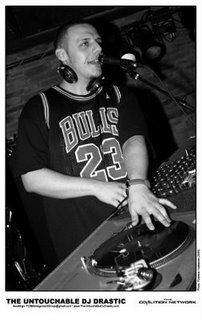 He then made me shut off my tape recorder as he played two tracks that I’ve never heard before; one being an untitled freestyle and the other was, “The World Is Mine.” I began to smile when I heard these records because Drastic erupted with energy. He said that the records were amongst his favorites. I personally thought that both of the records were club bangers. He continued to play exclusive material from reggae group T.O.K. and others for my opinion. He advised me that he was pressed for time at which point he ignited a blunt and we engaged in our interview. 01. When did your career as a DJ begin? 02. How did you get your name, “The Untouchable DJ Drastic”? 03. How has the business impacted your life? “The business has definitely changed me as person. I’m still not sure if it’s for better or worse. It’s difficult because I’m learning everything hands on. I never had a father to teach me how to play basketball or ride a bike. I taught myself these things. In the business, I feel the same way. I’m fortunate to be business savvy. This propelled me more than any other characteristic within me outside of my actual talent over the years. When you’re in the entertainment or music business, an awkward type of jealousy and hate can develop in certain people around you. Sometimes it’s disguised as an excessive amount of support. I knew that these situations existed although I didn’t expect to see it within my immediate circle. I’ve learned over the years to keep relationships simple. A lot of the time people say that I’m arrogant but that’s not the case. They haven’t walked in my shoes to understand where I’m coming from as a whole. People think that it’s fun and games to be in this field but most of time I’m miserable doing what I love, if that makes any sense. It goes way beyond fame or money. Me personally, the lack of sincerity eats at me inside. I’m a very genuine person so to have to deal with people that are not like me constantly, it’s a stretch. Honestly, not everyone is malicious some just might not know any better. 4. What initially influenced you to become a DJ? “I was discovered in 2000 by a group of nightlife promoters in New York as an emcee. At the time, I was working with a few different individuals locally. I would go to the studio and I felt uncomfortable for whatever reason. I had an offer but at that point of my life I didn’t have the passion to really move forward and act on certain opportunities as an emcee. I knew I loved the music. I just felt like everyone around me was trying to do what it was that I was trying to do. I didn’t have any guidance so I was afraid to be caught up in a bad situation. At the time, I had some side hustles and saved some money. I took myself down to Fulton Street in Brooklyn and purchased DJ equipment. It wasn’t anything fancy although it enabled me the platform to mold my style as an entertainer. 5. Do you provide services for any companies exclusively? 6. How do you feel about the mobile DJ business and/or private engagements? 7. What makes you better than the competition? 8. What’s on the horizon for you? “I’m getting ready to go to back to the United Kingdom to represent what I do in a major way. I’m going to be blasting off on Oxygen FM107.9 on the 26th of December. I’m also going to do a club run. I’ll be back in the states for New Years Eve. The American King Music family has a brand new MIMS album on the way. The single right now is “Move” and it’s bubbling on radio. I just finished shooting scenes for a new movie called, “Monkey Gang.” It’s hilarious and that’ll be out next year. I’m also in the studio working on an album in addition to a new project with The Grind Kings set to be released next year. I would definitely like to shoot a music video mid-2009 as well. I recently signed a contract to produce comedy sketches for DAPS (www.DogandPonyShowWebsite.com) and that’ll be out mid-2009. I also have an apparel line and a liquor to endorse next year. Other than that, I plan on staying in the clubs and continuing to impact radio on my mission to find my ideal outlet and/or comfort zone professionally. I always say that I’m one man doing the job of twenty in the lifetime of one. My personal goal is to find a good woman, get married, have a daughter, take care of my mother, and continue to focus on my career. We’re in exceptional times as a country. I don’t come from much therefore I never take for granted what I have and/or how fast it can be taken away even on my best day.